Water features can be incorporated into almost any existing landscape and they can add a level of personality unsurpassed by any other feature. From a small in-ground pond to much larger pondless water falls and water features that take advantage of an existing slope to a small meandering creek winding it’s way through your gardens, we can build it for you. Water features add tranquility and interest to your landscape and give you and your guests a place to sit back, relax, and enjoy the sounds of nature. Silver Lining Landscaping is a landscaping company based out of Brownsburg, Indiana and serving the surrounding area. We specialize in designing and building water features into residential landscapes. Whether you want a pondless waterfall, an in-ground pond, a water fountain, or even a woodland stream lined with river rock running through your property we can design and build a water feature that enhances your enjoyment from your landscape, improves it’s appearance, and works with your budget. Have you ever thought about having an in-ground pond in your backyard? 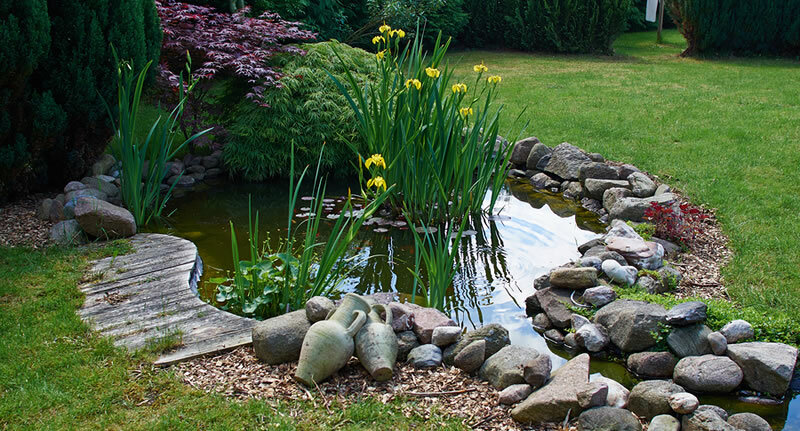 Ponds make a great addition alongside any seating area or close to your patio, or right as the center of one of your garden beds. We can build in-ground ponds in all shapes and sizes. They can include colorful water based plants and we can also incorporate natural stone to make your pond appear as if it was always meant to be there. Water fountains can add a dramatic effect to your landscape and the sound of the falling water can add a peaceful tranquility or even help drown out other background noises from a busy road or noisy neighbors. Fountains are also a great way to utilize an existing slope in your yard and depending on the size and steepness of the slope your fountain could contain more than one level with small cascading waterfalls down into the next level or even a small pond at the bottom. Waterfalls are another great way to utilize an existing slope in your property transforming what would otherwise be a problem into a beautiful and relaxing pleasure. We can build a waterfall that cascades over a retaining wall or into a backyard pond or one that cascades down a riverbed of rocks and small boulders for a more natural look. Fountains, waterfalls, and ponds all make a bold impact but what if you want a more natural look? Small streams or creeks are another great way to incorporate water into an existing landscape. A stream can wind it’s way through your garden beds and under a small bridge or surround your hardscape. They can be accented with water plants and natural stone and we design and build them for almost any sized space. Streams or creeks are another great way to utilize any natural slope in your property as the water naturally flows downhill. Your stream could begin at the base of a small waterfall or water fountain and meander it’s way into a small pond, the possibilities are endless and the only real limitation is your imagination. If you’d like to schedule a consultation with us to build a water feature on your property we’d be happy to meet with you. Please call (317) 902-5411 or fill out our online form and we’ll get right back to you.